moments in the making: Hello Spring! I don't know about you, but I am SO ready for spring! 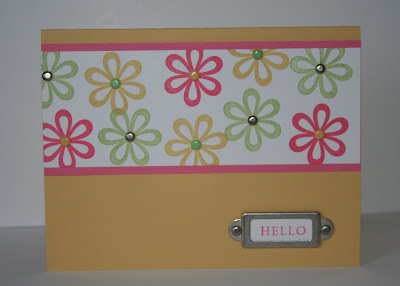 This simple card uses the flower from the Always set. I just stamped it in Certainly Celery, Regal Rose and So Saffron. Then I added brads. The hardware is the new Styled Silver in the Occasions mini. Love that hardware. The little "hello" is from the Fundamental Phrases ... a set I use probably most often for my sentiments. Most of them fit in the word window too, which makes them nice. Hey Shelly! Your cards are so cute! I love what you're doing here. Wish I had more time for it. I have such fond memories of stampin' nights at your house. Your old stampin' buddy, Carolyn. I love this card! Thanks for being so thoughtful and sending it to me. Your the best upline ever! I just wish I was as organized as you!!! Live Your Dream set - again! Shelly is a dedicated wife and mother of five blessings from around the globe. She is known for being an encourager, prayer warrior and advocate for the Fatherless. While serving with the ABBA Fund, Shelly strives not only to see children be placed in families, but for those families to thrive. She blogs at reachingheartsblog.com and is also a women’s speaker and enjoys traveling all over the US, bringing inspiring insight to impact and encourage all who hear.